Nickel and Cobalt based alloys are popular for the resistance to corrosion, especially at high temperatures. With functional temperature ranges up to 1200oC, they are able to provide extreme corrosion resistance, along with resistance to abrasion. Alloys International are Australia’s leading distributor of specialised nickel and cobalt based alloys, including Stellite, Inconel and Hastelloy equivalents. 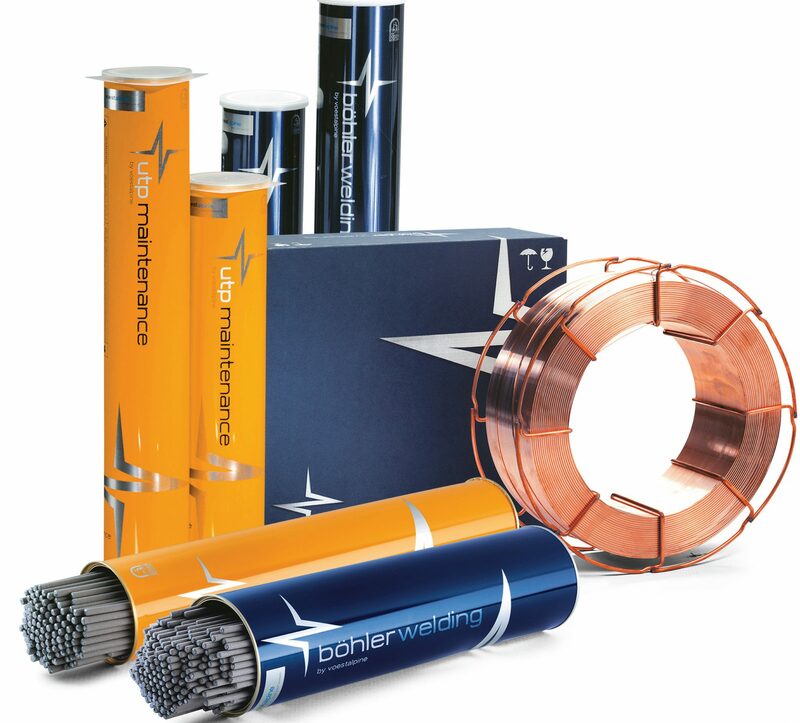 Types of consumables available include Stick Electrodes (SMA), TIG rods (GTAW), Cored wires, MIG/MAG solid wires, Submerged arc wires and flux (SAW), electroslag strip cladding strip and flux (ESW), and powders for Laser or PTA welding. DIN 1736: S-NiCr15FeNb Basic coated electrode for welding Ni-base alloys, of the NiCr type, together or to stainless or mild steels. Also used for joining and cladding of various clad steels, 9% nickel alloys, cryogenic alloys and a wide range of other nickel alloys. Especially suited for welding of dissimilar combinations and thicknesses, particularly where heavy sections, crack sensitive designs and high or low temperature service is a feature. Maximum operating temperature approximately 850° C. Joining Ni alloyed steels used in the low temperature fields such as 9% Ni steel. DIN 1736: EL-NiCr15FeMn Basic coated electrode for welding Ni-base alloys such as alloy 600, together or to stainless or mild steels. Also used for joining and cladding of various clad steels, 9% nickel alloys, cryogenic alloys and a wide range of other nickel alloys. Especially suited for welding of dissimilar combinations and thicknesses, particularly where heavy sections, crack sensitive designs and high or low temperature service is a feature. MIL-RN625 & EN 625 AI-0325 is a nickel-chromium alloy covered electrode that is used for its high strength and outstanding corrosion resistance and is designed to weld to itself or to other materials. One of the features of this alloy is that the welded deposits require no further postweld heat treatments to maintain their high strength and ductility. AI-0325 is used in various industries such as the marine and aerospace industry and also in chemical processing where it is an excellent choice for its resistance to pitting and crevice corrosion. It has excellent corrosion resistance to a wide variety of severe corrosive environments. The nickel and chrome combination provide resistance to oxidising chemicals, the high molybdenum supplies resistance to pitting and crevice corrosion. The niobium stabilizes the alloy during welding, thus, preventing inter-granular cracking. Applications include propeller blades, submarine motors, springs and seals for submerged controls, instrument components, engine exhaust systems, aircraft components. MIL E-21562 Type MIL-RN60 & EN60 AI-0390 is an electrode which is used for welding of MONEL* alloys 400 and 404 to themselves and each other. It can also be used as an overlay on steel after an initial layer of AI-0399. Dissimilar welding applications include joining MONEL* alloys to Nickel 200 and joining MONEL* alloys and Nickel 200 to copper-nickel alloys. This alloy has a high strength, good weldability and excellent temperature and corrosion resistance over a wide range of temperatures. Applications include: Valves, shafts, pumps, marine fixtures, electrical and electronic components, processing and refining equipment, heat exchangers etc. DIN 1736: S-Ni Mo 15 Cr 15 W AI-0395 is an alloy providing excellent deposits, which will withstand the single or combined effects of oxidation, corrosion, erosion and mechanical stress up to temperatures of 1100°C. AI-0395 also has excellent joining properties for nickel-based alloys such as Hastalloy and Inconel to themselves or to mild or stainless steel. Applications include: Building up of soaking pit furnace points, hot shear blades, mandrels and various forging tools, charge car arms, molten metal spouts and chutes, coal combustion activator pallets, rolling and wire drawing guides, piercing mandrels etc. AI-0601E-TDS AWS/ASME 11 C SFA 5.13 : ECoCr-C AI 601B is a cobalt based rutile coated electrode (Equivalent to StelliteTM* 1) for surfacing parts subject to either the single or combined effect of medium abrasion or metal-to-metal wear, and/or temperatures from 500°C to 800°C in corrosive media. The addition of tungsten gives excellent wear resistance. Applications include: rolling mill guides, pump bushes and spindles, steam turbine parts, extrusion dies. AI-0606E-TDS AWS/ASME 11 C SFA 5.13 : ECoCr-A AI-0606E is a cobalt based rutile coated electrode (Equivalent to StelliteTM* 1) for surfacing parts subject to either the single or combined effect of medium abrasion or metal-to-metal wear, and/or temperatures from 500°C to 800°C in corrosive media. This alloy is typically used for service conditions involving heavy impact and thermal shocks. Applications include: hot shear blades, valves (slurry, exhaust, metering etc. ), mill side guide rolls, ingot tong ends, seats, and nozzles. AI-0612E-TDS AWS/ASME 11 C SFA 5.13 : ECoCr-B AI-0612E is a rutile coated electrode (Equivalent to StelliteTM* 12). Particularly suited for surfacing parts subject to either the single or combined effect metal-to-metal wear, and/or temperatures from 500°C to 800°C in corrosive media. Applications include: Tools for cutting wood, paper, board, carpet and plastic. AI-0621E-TDS AWS/ASME 11 C SFA 5.13 : ECoCr-E AI-0621E is an electrode (Equivalent to StelliteTM* 21) designed for surfacing parts subject to the single or combined effects of metal-to-metal wear at high temperatures (500-800°C) repeated thermal cycling, friction, abrasion, high impact oxidation and corrosion up to temperatures of 1150°C. Applications include: Hot shear blades, Forging Bottom Dies, Cutting discs, Hot working tools, Wear Pads, Steam Valves, Seats and spindles, Ingot Bloom and Billet Holders. Deposit has the added benefit of being machinable. AI-1701-TDS AWS/ASME SFA 5.13 E : CO CR-C Cobalt based surfacing alloy particularly suited for surfacing parts subject to either the single or combined effect of medium abrasion and metal-to-metal wear, temperatures from 500°C- 800°C, corrosive media. Applications include: rolling mill guides, pump bushes and spindles, steam turbine parts, extrusion dies, plastics extruder screws and scrapers. AI-1706-TDS* AWS/ASME SFA 5.21 ERC : CoCr-A AI-1706 is the most universally used grade of the Cobalt based surfacing alloys providing excellent resistance to the single or combined effects of wear due to mechanical and chemical degradation over a wide temperature range. AI-1706 is a tough; impact and corrosion resistant alloy, which does not readily heat check under pressure at elevated temperatures and has excellent anti-galling properties. It resists chipping, spalling and oxidation at red heat while maintaining reasonable ductility and good high temperature hardness. The alloy has a low coefficient of friction and even after prolonged exposure to temperatures over 1000°C will recover full room temperature hardness. Applications include: diesel engine exhaust valves and seats; steam control valves; hot work shearing parts; edger rolls; hot trim dies; swaging mandrels; hot shear blades; cams; steam turbine parts; plastic extruder screws; scrapers; pit points; pump parts; components in hot zinc baths. AI-1706L-TDS DIN 8555 MF 20-GF-300-CTZ AI-1706L is a low carbon Cobalt based MIG welding wire which provides excellent resistance to the single or combined effects of wear due to mechanical and chemical degradation over a wide temperature range. Due to the low carbon content AI-1706L lends itself very well to semi-automatic and automatic welding processes by reducing the occurrence of lateral cracking in the deposit. AI-1706L is a tough; impact and corrosion resistant alloy, which does not readily heat, check under pressure at elevated temperatures and has excellent anti-galling properties. It resists chipping, spalling and oxidation at red heat while maintaining reasonable ductility and good high temperature hardness. The alloy has a low coefficient of friction and even after prolonged exposure to temperatures over 1000°C will recover full room temperature hardness. AI-1706MA-TDS AWS/ASME SFA 5.21 ERC : CoCr-A AI-1706MA is a modified Grade of the AI-1706. It provides excellent resistance to the single or combined effects of wear due to mechanical and chemical degradation over a wide temperature range. AI-1706MA is a tough impact and corrosion resistant alloy, which does not readily heat check under pressure at elevated temperatures and has excellent anti-galling properties. It resists chipping, spalling and oxidation at red heat while maintaining reasonable ductility and good high temperature hardness. The alloy has a low coefficient of friction and even after prolonged exposure to temperatures over 1000°C will recover full room temperature hardness. AI-1712-TDS AWS/ASME SFA 5.13 E: Co Cr - B Cobalt based surfacing alloy particularly suited for parts subject to either the single or combined effect of medium abrasion or metal-to-metal wear, temperatures from 500° C to 800° C, corrosive media. Applications include: tools for cutting wood, papers, cardboard, carpet, plastic etc. AI-1721-TDS AI-1721 is a MIG wire designed for surfacing parts subject to the single or combined effects of metal to metal wear at high temperatures (500-800°C) repeated thermal cycling, friction, abrasion, high impact, oxidation and corrosion up to temperatures of 1150°C. Deposit has the added benefit of being machinable. Solid solution of the austenitic type with precipitation of finely dispersed Cr + Mo Carbides. Applications include: Hot shear blades, forging bottom dies, cutting discs, hot working tools, wear pads, steam valves, seats and spindles, ingot bloom and billet holders. AWS/ASME A5.11, ENiCrCoMo-1 AI-1717 is a solid-solution strengthened, nickel-chromium-cobalt-molybdenum alloy with an exceptional combination of high-temperature strength and oxidation resistance. The alloy also has excellent resistance to a wide range of corrosive environments, and it is readily formed and welded by conventional techniques. The high nickel and chromium contents make the alloy resistant to a variety of both reducing and oxidising media. The combination of high strength and oxidation resistance at temperatures over 980oC makes AI-1717 an attractive material for such components as ducting, combustion cans, and transition liners in both aircraft and land-based gas turbines. Because of its resistance to high-temperature corrosion, the alloy is used for catalyst-grid supports in the production of nitric acid, for heat-treating baskets, and for reduction boats in the refining of molybdenum. AI-1717 also offers attractive properties for components of power-generating plants, both fossil-fuelled and nuclear. MIL-RN625 & EN 625 AI-1725 is a nickel-chromium alloy that is used for its high strength and outstanding corrosion resistance and is designed to weld to itself or to other materials. One of the features of this alloy is that the welded deposits require no further postweld heat treatments to maintain their high strength and ductility. AI-1725 is used in various industries such as the marine and aerospace industry and, also in chemical processing where it is an excellent choice for its resistance to pitting and crevice corrosion. Applications include: propeller blades, submarine motors, springs and seals for submerged controls, instrument components, engine exhaust systems, and aircraft components. AI-1726-TDS DIN 8555 MF 20-GF-200-STZ Cobalt based MIG alloy providing excellent resistance to metal to metal wear, thermal shock, and oxidation in corrosive environments at high temperature. For reduced levels of dilution and improved weldability, it is recommended to use pulsed MIG welding mode. The deposit has the benefit of being machineable. Applications include: hot working tools, forging hammers, ingot bloom and billet holders. As an underlay under harder cobalt based alloys. AI-1750-TDS AWS/ASME A5.13 RNiCr - B AI-1750 is a premium, nickel-based MIG Wire, used for hard surfacing parts to resist wear, heat, corrosion and galling. It has greater ductility and better impact resistance and workability than AI-1756 and AI-1760 and displays good machineability. Deposits of AI-1750 should not be applied to base metals that will subsequently be hardened or tempered. The deposits also cannot be hot or cold worked; however, they can be hot formed while in the plastic condition (between solidus and liquidus temperature). It has little tendency to warp work to which it is applied. Applications include: Hard surfacing of components in the petroleum industry, such as sucker rod couplings, centrifugal pump parts, heat exchanger tubes, wear rings, etc. Also used for hard surfacing camshafts (lobes), glass plungers, cement industry gate and glove valve components, dragline rollers and metalworking (forming and drawing) dies. AI-1756-TDS AI-1756 is a premium, nickel-based MIG wire, used for hard surfacing parts to resist wear, heat, corrosion and galling. It has better ductility and impact resistance than AI-1760 for plastic extrusion screws, shafts and sleeves. Deposits of AI-1756 should not be applied to base metals which will subsequently be hardened or tempered. The deposits also cannot be hot or cold worked; however, they can be hot formed while in the plastic condition (between solidus and liquidus temperatures). It has little tendency to warp annealed work to which it is applied. Applications include: Hard surfacing of plastic and rubber extrusion screws, wear rings, shafts, sleeves, cement gate valves, forming and drawing dies, and centrifugal pump parts. AI-1760-TDS AWS/ASME A5.13-80 : ERNiCr-C AI-1760 is a premium nickel-based hard-surfacing MIG Wire. It is rated as excellent in resistance to abrasion, corrosion, and galling and good on impact. It has excellent red hardness. A very stable alloy, it does not anneal. Its low coefficient of friction makes it excellent in metal-to-metal wear. It can be hot-formed while in the plastic condition (between the solidus and liquidus temperatures). Applications include: AI-1760 is applicable to hard surfacing of shafts, sleeves, valve trim and the like. DIN 1733 S-CuNi30Fe AI-1767 is an alloy designed for MIG welding 70/30, 80/20 and 90/10 copper-nickel alloys. It may also be used as an overlay on copper. Dissimilar welding applications include joining of MONEL* alloys and Nickel 200 to copper-nickel alloys. Applications include: Seawater desalination plants, condensers, heat exchangers, economisers, chemical apparatus, turbine condensers, chemical apparatus. AI-1776-TDS ASW/ASME A5.14: Er Ni Cr Mo-4 AI-1776 is a gas shielded, solid wire designed for joining and / or overlaying NiCrMo alloys. It can be used for joining NiCrMo alloys to themselves or to other nickel based alloys, to carbon steels, to low alloyed steels or to stainless steels. The as welded deposit exhibits outstanding resistance to deformation from cycling or static loads at elevated temperatures. AI-1776 is an excellent choice as an overlay on the nickel based alloys such as Hastelloys, Inconel and Illiums. Applications: AI-1776 is an alloy used for applications where the combined effects of impact, heat and corrosion resistance are required. It has been successfully used for the refurbishment of hot extrusion dies and moulds, die-stamping tools, hot forging moulds and cutting tools. The welded overlay will withstand oxidising atmospheres up to 1100ºC. AI-1782-TDS AWS/ASME A5.14 : ERNiCr- 3 AI-1782 is a nickel based filler wire used in the joining and cladding of similar materials such as Inconel 600, 601 and Incoloy® 800. AI-1782 is recommended for dissimilar welding applications such as Inconel® to Nickle 200, Monel® 400, stainless steels and carbon steels. This consumable can be used for materials, which operate at extremes of temperature from -196oC to 900oC. The AI-1782 gives a fully austenitic weld metal that withstands hot cracking. (ESSC), with new solutions for the single layer cladding of alloy 625 with reduced clad layer thickness and/or increased travel speed (patent pending). The new strip / flux combination cuts down on cladding time and the use of cladding materials, while meeting all prevalent industry requirements for the deposited metal. DIN 1736: EL-NiCr15FeMn Bare rod Ni-base alloy to weld alloy 600, together or to stainless or mild steels. Also used for joining and cladding of various clad steels, 9% nickel alloys, cryogenic alloys and a wide range of other nickel alloys. Especially suited for welding of dissimilar combinations and thicknesses, particularly where heavy sections, crack sensitive designs and high or low temperature service is a feature. AI-0340B-TDS AWS/ASME ENiCr-A AI-0340B is a premium, nickel-base alloy, as it has chromium boride crystals, (hardness DPH 4100) which are created through a proprietary two-stage exothermic process. The alloy is used for hard-surfacing parts to resist wear, heat, corrosion and galling. It has greater impact resistance and workability than AI-0350B, AI-0356B or AI-0360B, and displays excellent machineability. Deposits of AI-0340B cannot be hot or cold worked. However, they can be hot formed while in the plastic condition (between solidus and liquidus temperature). It has little tendency to warp anneal work to which it is applied. Hard surfacing of components, primarily glass plungers, blank molds, blow molds, neck rings, bottom plates, guide rings and baffle plates. Also used in other industries for plug and gate valves, wherein fairly good machineability is required. AI-0350B-TDS AWS/ASME ENiCr-B AI-0350B is a premium, nickel-base alloy, as it has chromium boride crystals, (hardness DPH 4100) which are created through a proprietary two-stage exothermic process. The alloy is used for hard-surfacing parts to resist wear, heat, corrosion and galling. It had greater ductility and better impact resistance and workability than AI-0360B and displays excellent machinability. Deposits of AI-0350B should not be applied to base metals which will subsequently be hardened or tempered. The deposits also cannot be hot or cold worked; however, they can be hot-formed while in the plastic condition (between solidus and liquidus temperature). It has little tendency to warp annealed work to which it is applied. Hard surfacing of components in the petroleum industry, such as sucker rod couplings, centrifugal pump parts, heat exchanger tubes, wear rings, etc. Also used for hard surfacing camshafts (lobes), glass plungers, cement industry gate and globe valve components, dragline rollers and metalworking (forming and drawing) dies. AI-0356B-TDS AI-0356B is a premium, nickel-base alloy, as it has chromium boride crystals, (hardness DPH 4100) which are created through a proprietary two-stage exothermic process. The alloy is used for hard surfacing parts to resist wear, heat, corrosion and galling. It positions between AI-0360B and AI-0350B in chemistry and hardness. It has better ductility and impact resistance than AI-0360B for plastic extrusion screws, shafts and sleeves. Deposits of AI-0356B should not be applied to base metals which will subsequently be hardened or tempered. The deposits also cannot be hot or cold worked; however, they can be hot formed while in the plastic condition (between solidus and liquidus temperatures). It has little tendency to warp annealed work to which it is applied. Hard surfacing of plastic and rubber extrusion screws, wear rings, shafts, sleeves, cement gate valves, forming and drawing dies, and centrifugal pump parts. AI-0360B-TDS AWS/ASME A5.13-80 : ENiCr-C AI-0360B is the original nickel-base hard-surfacing alloy. It was the successful largely because it contained chromium boride crystals, which have a hardness of DPH 4100. They are created through a proprietary two-stage exothermic process. The chemistry has been duplicated by others; none have duplicated the peculiar microstructure with its diamond-like chromium borides. AI-0360B is rated excellent in resistance to abrasion, corrosion, and galling and good on impact. It has excellent red hardness and has no peer in weldability. A very stable alloy, it does not anneal. Its low coefficient of friction makes it excel in areas of metal-to-metal wear. It can be hot-formed while in the plastic condition (between the solidus and liquidus temperatures). AI-0360B is applicable to the hard surfacing of shafts, sleeves, valve trim and the like. AI-03686CPT-TDS AWS/ASME ERNiCrMo-14 AI-03686CPT is a TIG rod consisting of a nickel-chromium-molybdenum-tungsten alloy with a higher than usual Cr+Mo+W level than the usual alloys used to weld C-276, alloy 622 and UNS 6022. This alloy is used for its high strength and outstanding resistance to pitting, crevice and general corrosion and is designed to weld to itself or to other materials. One of the features of this alloy is that the welded deposits require no further postweld heat treatments to maintain their high strength and ductility. AI-03686CPT is used in various industries such as the marine and aerospace industry and also in chemical processing where it is an excellent choice for its resistance to pitting and crevice corrosion. The high alloy content results in welds of exceptional corrosion resistance in the as welded condition and the deposit is extremely effective in environments requiring general corrosion resistance in hydrochloric or sulphuric acids, or mixtures of the two. Applications include pollution control engineering, chemical processes, petrochemical, oil and gas and marine industries. AWS/ASME A5.14-89 : ERNiCrMo-4 AI-0376T is a TIG consumable for the welding of Hastalloy® C and Hastalloy® C C 276 to themselves to Stainless Steel or to other Nickle based alloys. The as welded deposit exhibits outstanding resistance to deformation from cycling or static loads at elevated temperatures. AI-0376T is an excellent choice as an overlay on the nickel based alloys such as Hastelloys and Inconels. AI-0376T is an alloy used for applications where the combined effects of impact, heat and corrosion resistance are required. It has been successfully used for the refurbishment of hot extrusion dies and moulds, die-stamping tools, hot forging moulds and cutting tools. The welded overlay will withstand oxidising atmospheres up to 1100ºC. AI-0382T-TDS AWS/ASME A5.14 : ER NiCr- 3 AI-0382T is a Nickel based filler wire used in the joining and cladding of similar materials such as Inconel 600, 601 and Incoloy™ 800. AI-0382T is recommended for dissimilar welding applications such as Inconel to Nickel 200, Monel™ 400, stainless steels and carbon steels. This consumable can be used for materials, which operate at extremes of temperature from 196°C to 900°C. AI-0382T gives a fully austenitic weld metal that withstands hot cracking. DIN 1736 S-NiCu30MnTi AI-0390T is used for welding of MONEL* alloys 400 and 404 to themselves and each other. It can also be used as an overlay on steel after an initial layer of AI-0399. Dissimilar welding applications include joining MONEL alloys to Nickel 200 and joining MONEL alloys and Nickel 200 to copper-nickel alloys. This alloy has a high strength, good weldability and excellent temperature and corrosion resistance over a wide range of temperatures. processing and refining equipment, heat exchangers etc. 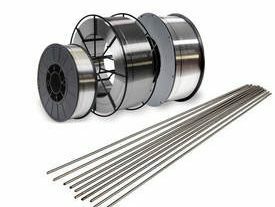 AI-0399T-TDS AWS/ASME A5.14 Class ERNi-1 (UNS N02061) AI-0399T is a Nickel alloy bare wire is used for the GTAW joining of Nickel 200 and Nickel 201. This includes ASTM grades such as B160 – B163, B725 and B730. AI-0399T is useful in a variety of dissimilar applications between nickel alloys to stainless or ferritic steels. AI-0399T is also used for overlaying carbon steel and in repairing cast iron castings. AI-0601B-TDS AWS/ASME 11 C SFA 5.13 : ECoCr-C AI-0601B is a cobalt based TIG or brazing rod (Equivalent to StelliteTM*. Applications include surfacing parts subject to either the single or combined effect of medium abrasion or metal-to-metal wear, and/or temperatures from 500°C to 800°C in corrosive media. AI-0606B-TDS AWS/ASME 11 C SFA 5.13 : ECoCr-A AI-0606B is a bare cast rod for surfacing parts subject to either the single or combined effect of medium abrasion or metal-to-metal wear, and/or temperatures from 500°C to 800°C in corrosive media, using either the TIG or Oxy welding process. Hardness and Toughness of deposited metal is used for service conditions involving heavy impact and thermal shocks. AI-0621B-TDS AWS/ASME 11 C SFA 5.13 : ECoCr-E AI-0621B is a bare/TIG/oxy rod (Equivalent to StelliteTM* 21) designed for surfacing parts subject to the single or combined effects of metal-to-metal wear at high temperatures (500-800°C) repeated thermal cycling, friction, abrasion, high impact oxidation and corrosion up to temperatures of 1150°C. Applications include: Hot shear blades, Forging Bottom Dies, Cutting discs, Hot working tools, Wear Pads, Steam Valves, Seats and spindles, Ingot Bloom and Billet Holders. Deposit has the added benefit of being machineable. AI-1625ST UTP Record EST 625 The strip / flux combination SOUDOTAPE 625 / RECORD EST 625-1 LD has excellent cladding charac-teristics. The fusion line is flat and free of defects. The total thickness (including penetration) is around 5.2 mm and the relief of the top surface varies within a few tenth of a millimeter, which reduces the amount of machining necessary. The ratio penetration / total thickness equals a geometrical dilution of 5.8 % matching with 6.0 % Fe.